Among Florida cities, Sanford has a remarkable amount of green space. 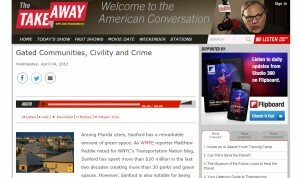 As WMFE reporter Matthew Peddie noted for WNYC’s Transportation Nation blog, Sanford has spent more than $20 million in the last two decades creating more than 30 parks and green spaces. However, Sanford is also notable for being home to numerous gated communities — like The Retreat at Twin Lakes, the neighborhood where 17-year-old Trayvon Martin was shot and killed as he walked back from 7-Eleven.